ALiVE Mod for AI or Occupation? So I see people recommending Occupation AI over A3XAI. But what about ALiVE for the AI? You don't have to use all of ALiVE. You can just have ALiVE handle some of the AI. It is modular and they released it on Github as an OpenSource project within the last year. ALiVE (Advanced Light Infantry Virtual Environment) is an easy to use modular mission framework. It has a Virtual Profile System that supports thousands of units operating simultaneously across the map with minimal impact on server performance (Caching). Unlike older/other caching systems, Virtual AI groups will continue to move, operate and fight and will seamlessly spawn into the visual game world when players are in range (configurable). 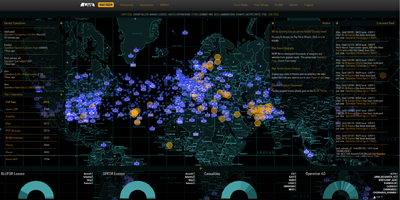 ALiVE identifies key military, industrial and civilian installations automatically for any map. It uses an advanced, multi-layered AI Operational Command structure which assesses the strategic, operational and tactical situation across the battle-space, analyses the relative strengths of enemy and friendly forces and issues missions accordingly. The result is a fluid, dynamic and credibly realistic battlefield as forces modeled on real world Combined Arms doctrines fight for key objectives. The second generation Persistent Campaign system automatically retains mission critical data on an external database without any user installations required (server-side) - no need for complicated MySQL databases, it is all handled completely automatically (requires a dedicated server). The intuitive, easy to use modular framework means mission making with ALiVE is quick and easy, even if you have never opened the editor before. Simply place modules down and play. ALiVE can be used completely stand-alone or as part of more complex missions and scripts (Occupation AI/A3XAI/DMS). Another part is the new, fully in-game GUI for building unit, group and faction configs as well as making custom maps work with ALiVE without having to learn the intricacies of config editing. For those interested, another feature is the ALiVE War Room. It is somewhat similar to mArma. ALiVE is complex but not complicated. Each module is standalone but they can be synchronized to each other to create different scenarios. The modules work independently but will use data derived from another module if it is synchronized. This layered approach provides a high degree of flexibility and allows you to build custom scenarios quickly. Everything starts with the Placement modules. These modules fulfill two important functions: they identify a list of military and civilian objectives or areas of importance across the map and secondly, they place the AI groups. There are several module parameters for customizing the type of objectives and also the shape and size of the AI forces. Refer to the Military and Civilian Placement Module pages for further details on these. If an AI Commander is placed, it will take command of all available AI forces of its faction. However, it needs to know where its objectives are and this is simply done by synchronizing it to one or more Placements Modules. So for example you could place an OPFOR Military Placement module to occupy an area of the map then sync a BLUFOR AI Commander to it so it knows to attack those objectives. Using different combinations of modules it is possible to quickly create a huge range of scenarios, from massive tank battles to intense urban counter insurgency. The best way is to experiment! 1. ALiVE is a massive performance hog. 2. ALiVE in it's current state will break Exile or the other way around. 3. Tons of things needs to be recoded to work with Exile rather than against. 4. Reason for people recommending DMS + Occupation instead of A3XAI is because A3XAI is very out-dated and a performance hogger as well, the developer of A3XAI abandoned the project because of ungrateful fools on the forums. 5. DMS is continuously being developed, the same with DMS Occupation, and has good documentation and support. 6. To make ALiVE work with Exile you would need to tie it into the Exile threading system to increase performance. 7. ALiVE War Room is far from being the same as mARMA, some elements are similar I agree, but far from being the exact same. I beg to differ on the performance hog. Sounds like someone who's never really used ALIVE tbh. The profile system is far from a performance hog for what it does, hell, its purpose is to INCREASE performance, and the rest of ALIVE is modular..
usually if it's a performance issue the mission has far too many AI spawning (novice ALiVE mission makers suffer from this ailment) or a bucket-load of mods running. Mission making with ALiVE is all about testing and debugging the mission to make sure you have settings right for your player count and mission objectives. It's not an exact science like DAC handles AI spawning - things are a bit 'fuzzier' with ALiVE. ALiVE is a hog if you use every possible module at once sure. But, the AI are cached and only spawn in when the player themselves is within a specific range of the AI forces. I have easily run ALiVE with Wasteland with a bunch of mods and did not suffer from server lag. The FPS was 40-50 and no issues. Perhaps you are thinkning of first generation ALiVE. ALiVE.OS is a different beast altogether and there is no requirement to use persistence etc. You can literally only use ALiVE to handle weather. It is very much like how ACE3 works. It is all modular meaning you can add and remove chunks or modules/features of it to your hearts content. My main issue with Occupation mod is that it does not seem to cache the AI which means that the AI are constantly eating up resources instead of like with ALiVE, the AI get cached which saves resources and increases performance until they are needed. how does Exile handle spawning units/groups? Im not trying to start a war or anything but those were quotes from some mission makers and devs from ALiVE when I asked them if ALiVE was a resource hog and asked them about most of your points. Alive performs significantly better than DMS, Occupation or A3XAI for me. With *way* more AI. ALiVE works great with Exile as long as you stick to ALiVE's AI modules and avoid using the other modules (like respawn). I got ALiVE running nicely with Exile in an afternoon. It took another hour the next morning to script the ALiVE AI to have ExileMoney, Respect and loot. DMS (like lots of other addons) focuses the admin on editing scripts and config files and testing iteratively which was fine when I was unemployed but painful if you value your time. With ALiVE you can place your prisoners in the middle of a dynamic, populated environment just using the 3DEN editor. And here's the kicker; the AI environment is different every time. Exile AI mods are just so predictable. You could, but I didn't need to. 50 FPS, 40-50 CPS. We only have half a dozen players on Chernarus but the server is also weak. YMMV. Your post discouraged me from even trying to get Exile and ALiVE working for like 2 weeks. I'm glad that in the end I didn't listen to you. @speedweasel would you be willing to work (answer questions) for those of use that are interested in ALIVE. I wouldn't be against putting the time into the system. We use to use Fmissions (Foamy's system) back in the A2/Epoch days. You had to build your own missions (which 90% of the population are either too lazy or don't want to spend the time) so it never really took off. ALIVE has amazing potential from what I've seen about it. Happy to answer questions. ALiVE doesn't work perfectly with Exile but you can get it to work well enough.